This listing is for a customized bridal party package with ninefold over yoga pants package with custom bridal rhinestones. This item is available in black, white, brown and charcoal yoga pants or yoga capris. If you would like to mix and match please mention it in the note at check out. If you are interested in this package in black or white fold over shorts, please message me. The rhinestones are clear and placed on the fold over portion on the back of the pants. If you prefer a different location, let me know in the notes when you check out . I can also add a monogram initial of your bridesmaids on the front left hip. If you would like this option please specify in the notes and what initials. Great item for a the bride to get ready in or a gift for the wedding shower. 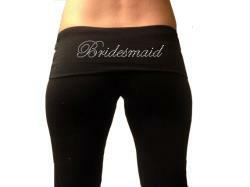 Seven fold over yoga pants or capris with your choice of rhinestone wording. Bride, bride to be, wifey, just married, matron of honor, maid of honor, bridesmaid, jr. The bride and wifey are available in clear, hot pink or blue. In the notes at checkout please specify the wording you would like with the desired size and style .